Explanation: On July 20, 1976, NASA's Viking 1 lander become the first spacecraft to land on Mars, followed weeks later by its twin robot explorer, the Viking 2 lander. Operating on the Martian surface into the early 1980s, the Vikings took thousands of pictures, conducted sophisticated chemical searches for life and studied the Martian weather and geology. In the dramatically detailed image above, a field of rocks and boulders is viewed from the Viking 1 landing sight on Chryse Planitia (the Plain of Chryse). 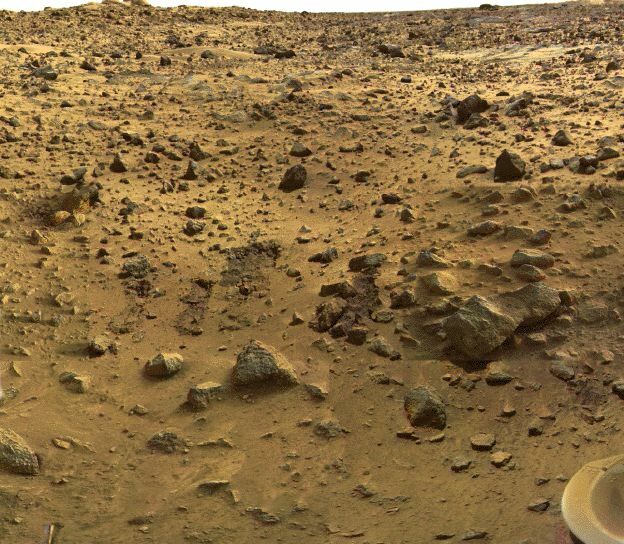 Viking 1's dusty foot pad is just visible at the lower right. The image was created by combining high resolution black and white images with lower resolution color images of the same area. NASA is planning to continue its extremely productive and well chronicled exploration of the mysterious Red Planet with the Mars Global Surveyor and the Mars Pathfinder missions. What's Mars like today?